Before Plantation Shutters became widely known in the UK, when deciding on window coverings you may have been faced with but two options; curtains or blinds, nowadays however, the popularity of shutters is booming as more and more people hear about them and see the stunning results. The stunning aesthetic charms of window shutters are clear, the ambience, the designer good looks and the clean crisp lines. However, shutters are not only beautiful, they are extremely practical and once you experience them in your home, you will never go back! Shutters are made to measure and can fit any shaped window or door, they can even be used as room dividers and wardrobe fronts. They come in a huge variety of materials and finishes, Just Shutters can boast the largest range in Whitchurch, and the whole of the UK besides. Shutters also have a wealth of benefits, including being wipe clean, low maintenance, they open fully to reach windows behind, offer privacy while allowing light into the room, add value to your home – and much, much more…. As a result it is no surpirse that shutters are now the desirable option for window coverings in your home or business premises. Feeling inspired by all of these benefits? of course you are! 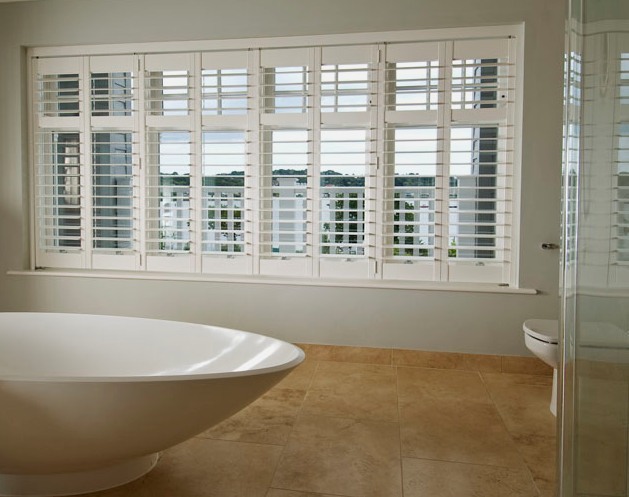 Browse our photo galleries for examples of our stunning shutters and see how they could fit into your decor. We are proud to be the leading shutter specialists in Whitchurch, our approach to customer satisfaction has earned us an unrivalled reputation in the field, with over 1500 reviews on checkatrade, giving us an overall score of 9.9/10. We don’t have salesmen, we have expert shutter designers who can advise you on your options, we don’t have freelance fitters who come in to do a job, we have our own expertly trained master fitters who are quite simply the best in the field. Shutters are not part of what we do, they ARE what we do, our passion and our pride. Call us today and find out just what Just Shutters Whitchurch can do for you: 01743 290 688. Advice, measurements and fitting plantation shutters. Provision and fitting of window shutters.